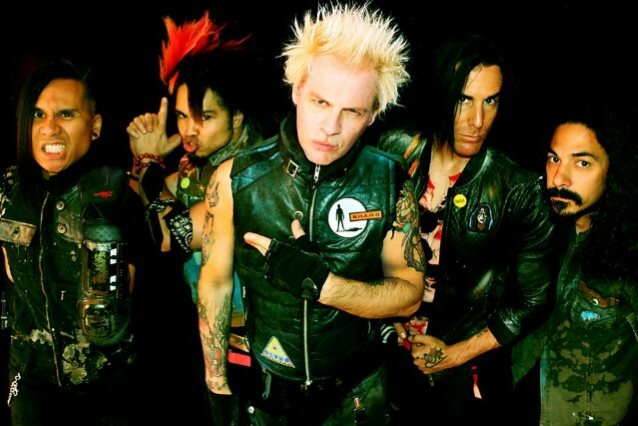 POWERMAN 5000 has inked a worldwide deal with Pavement Entertainment. The band's new album, "New Wave", will be released later in the year. POWERMAN 5000 vocalist Spider One stated about the follow-up to 2014's "Builders Of The Future": "We went a bit dirtier on this one. Ripped it up more than the last couple of records. One of the goals was to recreate the noise of the live show. Keep in the chaos." Regarding the new album title, Spider said: "New Wave? Are we a new wave band? Well, I would say that we have always had more in common with DEVO than DIO." "New Wave" is POWERMAN 5000's eleventh official release since forming in 1992 and continues the strides and success, from their platinum-selling album "Tonight The Stars Revolt!" to their most recent chart-topping single in 2014, "How To Be A Human". "Builders Of The Future" sold around 4,200 copies in the United States in its first week of release to debut at position No. 63 on The Billboard 200 chart. Issued in May 2014, the CD was released through POWERMAN 5000's partnership with T-Boy Records, a co-venture with Universal Music Enterprises founded by veteran rock manager Andy Gould.